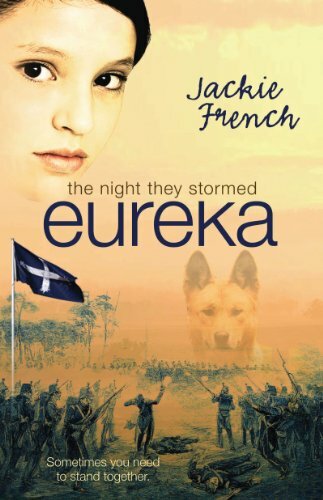 This term we are reading the book The Night They Stormed Eureka by Jackie French. The subject matter fits well with our history unit and the book is set at the right level to cover our Stage 3 comprehension outcomes. The work we do with this book is self-paced, although you are still required to finish this and the assigned work by the end of the term. If you are finding it difficult to complete the reading in class, it is suggested you get a copy from the local library, bookstore or eBook. You may also borrow your class book to read before school starts, unfortunately these are not permitted to go home. 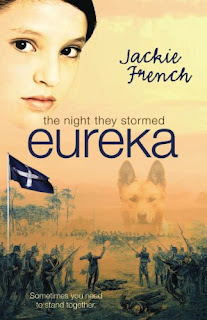 A story about dreams, gold, rebellion ... and an unlikely friendship across time It's 1854, and the Ballarat goldfields are a place of dreams and rebellion as Sam, a homeless teenager, is called back to the past to join the Puddlehams, who run 'the best little cook shop on the diggings'. the Puddlehams dream of buying a hotel with velvet seats, while others dream of freedom from the British crown, away from the rule of wealthy landowners and corrupt officials. As the summer days get hotter, and the miners' protests are ignored with catastrophic results, Sam experiences first-hand the power of a united stand which will change her life forever.